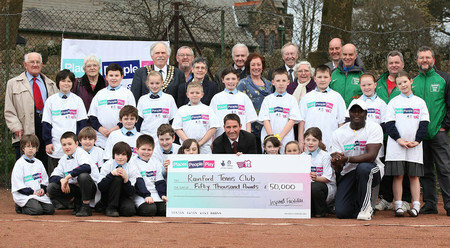 Rainford Tennis Club has secured £50,000 of Olympic legacy funding from Sport England’s Inspired Facilities Fund. The Inspired Facilities fund is part of the £135 million Places People Play legacy programme that is bringing the magic of a home Olympic and Paralympic Games into communities across the country. The funding will enable Rainford Tennis Club to install three additional porous macadam tennis courts. This will allow tennis to be played all year round whilst also enhancing the participation experience of current players and encouraging more individuals to partake in tennis. Sport England’s Chair, Richard Lewis, said: “This investment will create will be a fantastic sporting legacy for St Helens." Club Secretary, John Case: “We would like to thank SPORT ENGLAND, St Helens Council, Rainford Parish Council and all our other supporters for helping us to gain this award. This will enable Rainford Tennis Club to continue its exciting developments and investments for the future, by delivering excellent new tennis facilities for Rainford, St Helens and the surrounding areas. Representatives from Rainford Tennis Club, along with children from Rainford Brook Lodge Primary School, are pictured receiving the cheque from Sport England.